1. iPhone: Famously introduced in 2007 by Steve Jobs as an iPod, a phone, and an internet browser—all in one device. The original iPhone wasn't the first smartphone, but it was the one that blew off the lid for public interest in having such a device. The big selling points were the incredibly simple interface, 2-megapixel camera, sleek look, and the on-screen keyboard. It's hard to overstate the significant of the original iPhone, both for the future of Apple as a company and for the tech industry as a whole. Image courtesy of Flickr user Carl Berkeley. 2. iPhone 3G: The followup to the original iPhone came out a year and a half after, and was headlined by the technology in the name. Aside from the 3G data though, the iPhone 3G also got the introduction of GPS, allowing for turn-by-turn directions and mapping way back in 2008. 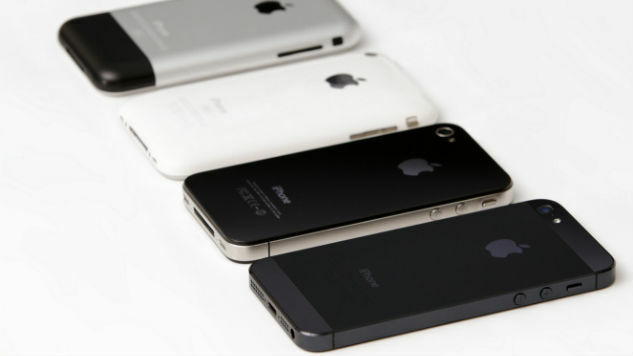 The 3G also was the first iPhone to come with color variants: black and white. Perhaps most importantly, though, the 3G introduced the world to the App Store, which would go on to have a huge impact on the future of smartphones and mobile computing. 3. iPhone 3G S: The 3GS was the first iPhone to start the "s" naming trend, though originally it stood for "speed," as was noted in the keynote speech. Though the 3G S looked nearly identical to the 3G, the headlining feature on the 2009 iPhone was quite a big deal: a multi-touch display. Important gestures like pinch-to-zoom, taps, and swipes first came to the iPhone, as well as the ability to take video. 4. iPhone 4: While the 3G and 3G S was plastic and a bit chunky, the completely redesigned iPhone 4 was a huge step forward in build quality and materials with its glass black and metal frame. More than that, the iPhone 4 also was surprisingly thin, touted by Jobs as the thinnest smartphone ever made and the first smartphone to be designed by Jony Ive. The iPhone 4 was also the first iPhone to come with a front-facing camera. On the software front it was a little lighter, but the two big features were the multitasking screen and the introduction of FaceTime. 5. iPhone 4s: The iPhone 4s is a particularly important release in Apple's history, overshadowed by the death of Apple CEO Steve Jobs just the day after. As for the actual device itself, the iPhone 4s introduced the world to Siri, Apple's voice-command digital assistant. The 4s also came with a big update to the rear camera, which came with a 8-megapixel camera and the ability to shoot in 1080p. 6. iPhone 5: Developed under the leadership of new CEO Tim Cook in 2012, the iPhone 5 came with a bit of controversy upon its release. First off, the failure of Apple Maps really caught the attention of the public, leading to both an official apology and the firing of lead software designer Scott Forstall. There was also pushback to the introduction of the Lightning port, which replaced the 30-pin connector and made many accessories and ports no longer useable. Amidst concerns about leadership and a hiccup in stock prices, the bigger, thinner, lighter, and full aluminum iPhone was still a big success. 7. iPhone 5s / 5c: After the trepidation surrounding the iPhone 5, all eyes were on CEO Tim Cook in 2013. Though the iPhone 5s looked identical to the iPhone 5, it marked a huge change to Apple's operating system with the launch of iOS 7. Under the new command of Jony Ive, iOS 7 was a complete redesign of the look of iOS with an emphasis on white backgrounds, transparencies, and more abstract images. In addition, the iPhone 5s introduced the world to Touch ID, a massively successful piece of security technology that is still influential today. Looking back, the 5s may have been the most significant release since the 3G. The 5c fared much less well as a cheaper, less premium option that had the internals of the iPhone 5, wrapped in pastel plastic cases. The cheaper model never gained the momentum it needed to be continued in the following year. 8. iPhone 6 / 6 Plus: Under the pressure of the continuing success of Android and Samsung, Apple finally made the move to a bigger iPhone—or more specifically, iPhones. The 4.8-inch (iPhone 6) and 5.5-inch (iPhone 6 Plus) models are Apple's attempt to keep up with a growing number of smartphone users who craved bigger screens on their devices. Along with the bigger screens came with an even thinner body and a new all-aluminum design. Image courtesy of Karlis Dambrans. 10. iPhone 7 / 7 Plus / iPhone SE: There are plenty of rumors out there about the iPhone 7, but few things are known for sure. The iPhone SE though was recently released, which is Apple's latest attempt to recapture the midrange, smaller-phone market. The SE, which stands for Special Edition, is almost identical to the iPhone 5s in size and design, but has the higher-end internals of the iPhone 6s. So far, it looks like it will have much more success than the iPhone 5c was. The history of the iPhone goes back to before 2007, when the first rumors of Apple’s smartphone were floating around. The tiny personal computers we all carry around in our pockets, whether it’s an iPhone, an Android, or some other kind of smartphone—have been greatly impacted by the last 9 years of iPhone history. So lets take a trip back into the past and see how the iPhone got to where it is today.